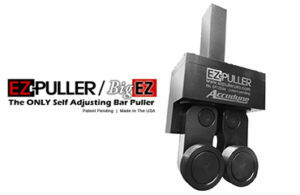 EZ-Puller, known for eliminating wasted set up time and fine tuning of traditional bar pullers, has released their bar puller at a low introductory price. With no necessary mechanical adjustment, the bar puller has the benefit of one time setup that will never need adjustment. The X-axis end points are changed within the program when changing bar diameters. Bar size can be changed in mere seconds resulting in extreme repeatability with less material wasted per part. The Bar Puller from EZ-Puller has no gripping fingers that need to be adjusted or that can be lost or broken. It works on round bar (range: .93″ – 1.750″), hex (range: .125″ – 1.375″) , and square stock (range: .125 – 1.000″), without spindle orientation. The EZ-Puller Bar Puller’s robust design lends itself to a long service life. Coolant is not needed to activate the low mar grippers. This revolutionary design provides minimum material penetration with maximum grip. Accudyne Corporation is a job-shop/machine shop that performs lathe work is often short run 5-10-50 or 100 pieces. In most cases, the short run nature of the job did not warrant setting up traditional bar pullers because it took too much time. However, doing things this way meant Accudyne Corporation had to put an operator in front of the machine to manually pull the bar after each part was completed. This was lost production. A bar puller was needed that could be set up for any bar diameter within the range of the tool in seconds. The tool needed to be reliable, repeatable and rugged enough to stand up to the probability 100’s of thousands if not millions of pulls over the lifetime of the tool. The tool is sold through Accudyne products.